A few weekends ago I went on a weekend getaway to Flagstaff, Arizona, to spend some time in the snow. I know many of you are totally rolling your eyes at me right now -- with all of the storms going on I'm sure you're wondering why I would seek snow out! Nevertheless, this desert-dweller did, and when I was choosing my polish, only one question was on my mind. "What would look best contrasted against the white of the snow?" I ended up grabbing OPI My Paprika is Hotter Than Yours, from the new Euro Centrale collection. I wore it alone all weekend with no chips and only minor tipwear, and when I got back home, I added some easy nail art to refresh the look a bit. Enter: the dot French tip. Before we get into the logistics of the dots, let's talk about the colors. OPI My Paprika is Hotter Than Yours is a scorchingly bright red-orange hybrid shade. Honestly, I couldn't choose between an orange or red description for this color even if I had to. It seems to morph constantly, causing you to doubt your knowledge of and eye for colors in a seriously cool way. I needed two coats for opacity. OPI...Eurso Euro is a deep and dark navy. This seemed to have great pigmentation and opacity when I used it for the nail art! 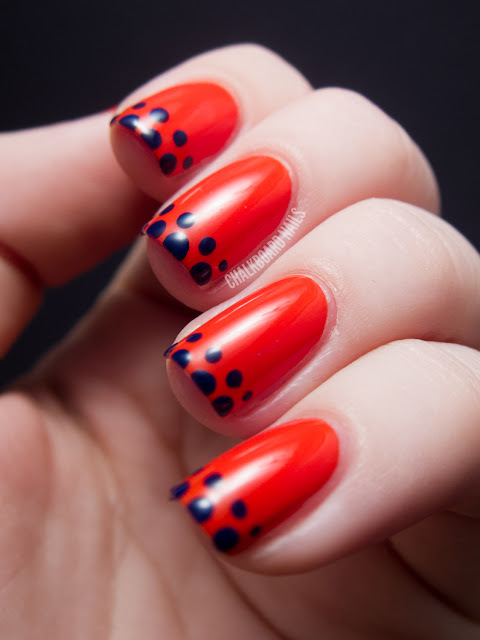 I used a large and small dotting tool to apply the dot tips. I chose to make the larger dots to go off the edge of the nail. If you don't have a dotting tool, there are plenty of substitutes you can find around the house. For example, the rubber tip of a bobby pin, the plastic ball on the end of a sewing needle, and a toothpick would all make great dotters. Just look for two items that will help you make dots of different sizes. What do you guys think? Is this bright orange-red shade heating you up or leaving you cold? The OPI Euro Centrale Collection is available now at Professional Salons, including Beauty Brands, Beauty First, Chatters, Dillard’s, JCPenney, Pure Beauty, Regis, Trade Secret, and ULTA, for $9.00 ($10.95 CAN) suggested retail for each lacquer. I love the dotted french tip! I'll definitely be trying this. I have Eurso Euro (the only one I bought from the Euro Centrale collection so far), so maybe I'll do the inverse with some red (I don't have orange-red.. yet) dots.. or hot pink dots.. or hot pink and gray dots! So cool!! 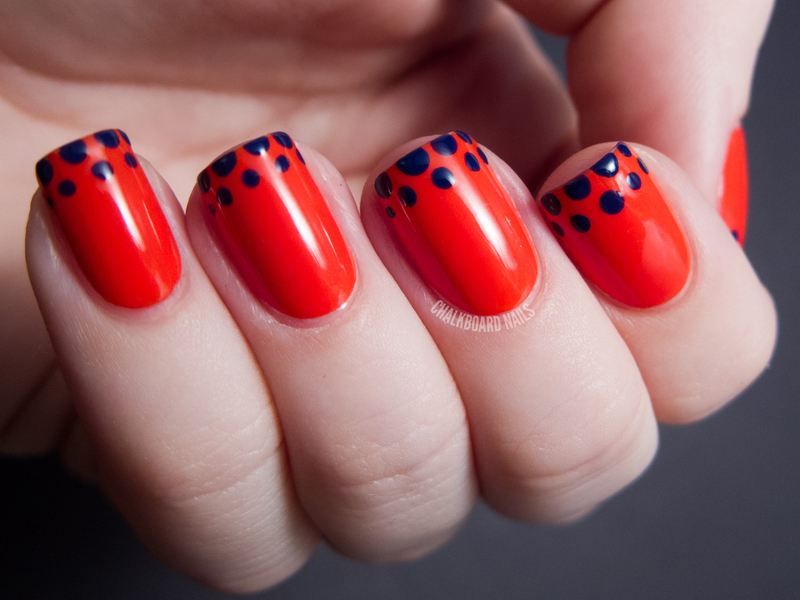 I think it would look cool with a lighter color dot-tip, too...or maybe a hot pink on that hot red-orange! Really cool and easy, I love it!! Oh, so beautiful! I love the beauty of simplicity! Looks goooorgeous on you ♥. I declare myself a paprika lover! I love this combination! The paprika color is gorgeous! Gorgeous color...looks fab against your milky skin too! I'd love this against my caramal tone, too! 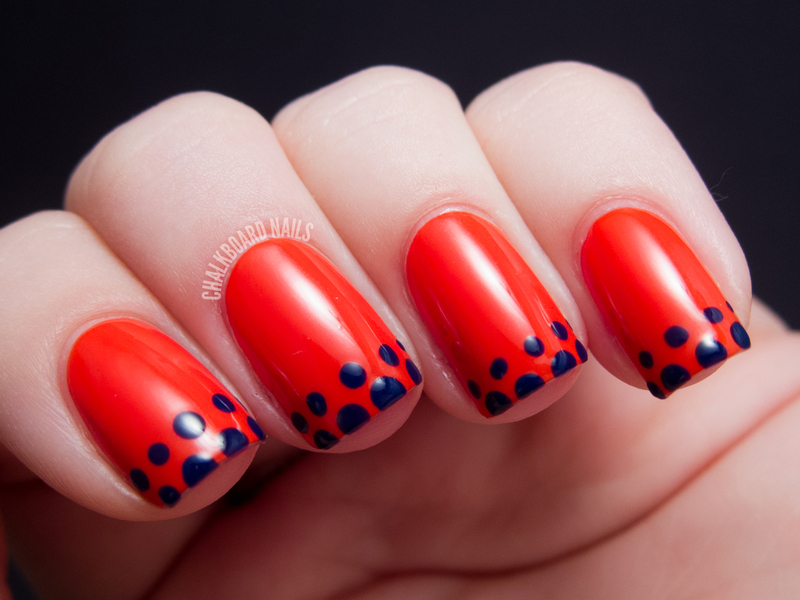 The dot french mani is TOO Cute!!! Well done! I have this color on right now with a white and yellow daisy with green stem on the ring fingers. But will def have to try this polkdot tip. Love it! Had Eurso Euro on 2 weeks ago.